VIOLET GREY profiles female beauty entrepreneurs who are considered industry game changers because of their individual approach to business. Each one entered the conversation in her own manner and maintained a steady, if not unparalleled, trajectory with her indomitable spirit. 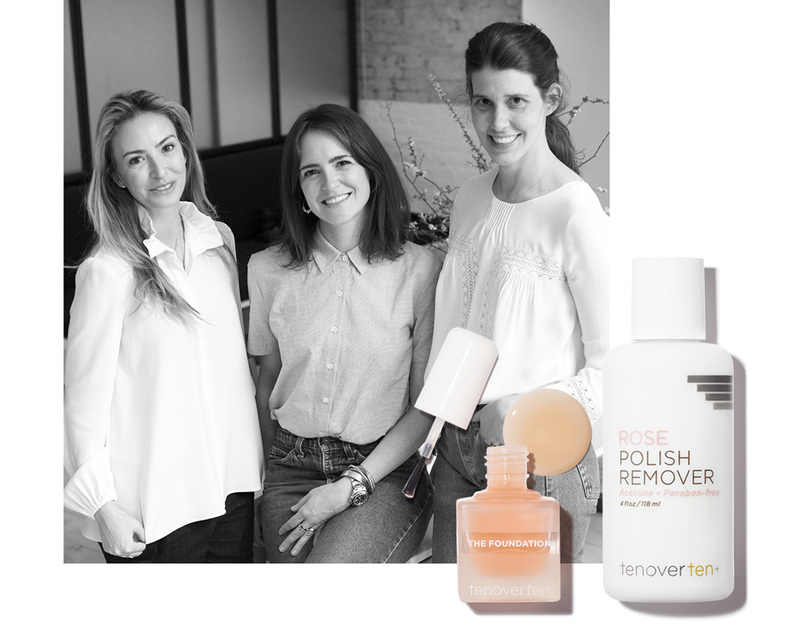 Here, we talk to the tenoverten founder trio. N.A. : My bedroom is minimalist and serene. There isn’t too much color, and I have completely pure white bed linens and white blackout shades. A.I. : My bedroom is layered with my favorite treasures—a portrait of my great-grandmother in the original gold embellished frame, a Josef Albers print my father gave me, art from the kids, and wedding pictures. I love color and print. I’m not a minimalist like Nadine! But I appreciate that look too. J.F. : My bedroom is very peaceful. It’s mostly all white with a few neutrals for contrast. We have beautiful natural light in our bedroom, and the walls are French doors and glass. It really is my sanctuary. N.A. : I am completely obsessed with my mattress. I bought a Duxiana mattress more than 10 years ago and it was a huge investment. My dad convinced me to splurge on that instead of a couch because we spend a third of our lives in bed. I also love my Kassatex bedding. I truly look forward to getting into bed each night. A.I. : My bed frame is upholstered in my favorite color. It’s a bit silly, but it’s a hard color to describe so when making decor decisions, I refer to a Postalco notebook in light blue because it’s the perfect shade. My headboard is outlined in brass nail heads, and I have crisp Matouk sheets in one of their signature styles. I like a classic feel. J.F. : We have a tall natural linen tufted bed with all-white bedding. My favorite thing is that it feels cozy and happy. We have lots of family movie hangs in our bed. A.I. : Unfortunately, our 5-year-old wakes us up pretty consistently at 5:40 a.m. N.A. : Around seven to eight. A.I. : Since I was a kid, I’ve required eight to ten, but I’m certainly not getting it! J.F. : I’m a sleeper, for sure, so about seven to eight. N.A. : Next to my bed I keep a water decanter with a glass, a Vitruvi diffuser with de Mamiel Altitude Oil, coconut oil, and Doctor Rogers Restore Healing Balm. A.I. : I keep a Lord Jones tincture in peppermint, along with the True Botanicals Moisture Lip Balm that I got in my last Sun & Moon box. I also keep Naturopathica Chill Aromatic Alchemy next to my bed. J.F. : Tenoverten Rose Cuticle Oil and the new Restorative Hand Cream we’ve been developing. I also have water, Nucifera The Balm, and the Lord Jones CBD Lotion or their tincture to help with aches and pain or stress! N.A. : Celery juice, coffee, and a green smoothie or grain-free granola—in that order. A.I. : I drink only decaf lattes. I’m not a caffeine person, but I enjoy the ritual and soothing warmth. I know I shouldn’t, but I usually skip breakfast, although recently we’ve been making a lot of smoothies for my daughters, so I’ll have whatever’s left over. I also take Herbalore Catalyst Gold supplements in the a.m. J.F. : I drink an almond milk latte in the morning, and at night I usually have a detox or calm tea to wind down. I’ve always been terrible about eating breakfast, so I try to at least get a shake in, which is usually a Clean program shake by Dr. Junger. N.A. : Yes, otherwise I won’t do it. I aim for three to four times a week. A.I. : I’m an oddball who enjoys working out in the late afternoon. I have too much on my mind in the morning to throw myself into a workout, so I prefer to meet my trainer or go to a class in the late afternoon when I (hopefully) feel like I’ve accomplished a lot for the day and can clear my mind a bit. J.F. : Yes! Working out has always been a big part of my physical and mental routine. It serves me equally on both fronts. I’m a huge fan of LEKfit and hot yoga or SoulCycle. N.A. : I don’t wash my face in the morning. I simply splash water on my face and then apply Vintner’s Daughter Active Botanical Serum on damp skin. I let that rest as I go about my morning at home, and then apply Suntegrity Natural Moisturizing Broad Spectrum SPF 30 before heading out for the day. A.I. : I wash my face with One Love Beauty Vitamin B Enzyme Cleansing Oil, spray my face with the True Botanicals Nutrient Mist, and then apply their Pure Radiance Oil. Before I leave the house, I use Image PREVENTION+ Daily Ultimate Protection Moisturizer SPF 50 and Supergoop Eye Cream with Oat Peptides. J.F. : I always drink a big glass of water before I do anything. Then I wash my face with a Susanne Kaufmann cleanser or one from Osea. Then I use the Biologique Recherche Eau Micellaire Biosensible and Vintner’s Daughter Active Botanical Serum or Osea Cream applied with a two- to three-minute facial massage. And of course, Supergoop! sunscreen, always. N.A. : I use RMS “Un” Cover-Up concealer, Ilia Tinted Moisturizer, Kimiko Super Fine Brow Pencil, Jane Iredale Clear Eyebrow Gel, Shu Uemura Lash Curler, RMS Lip2Cheek, and W3ll People Mascara. A.I. : I’m pretty minimal when it comes to makeup. I rotate between Kjaer Weis Cream Blush in Blossoming and RMS Lip2Cheek in Demure. Then I’ll throw the Olio E Osso balm in my bag in No. 2 French Melon. I also use Beautycounter Volumizing Mascara and I can never part with my CHANEL Rouge Allure lipstick in Pirate. J.F. : I use Kimiko Brow Pencil, a lash curler, RMS Mascara, Koh Gen Do Aqua Foundation applied with a Chanel foundation brush, and ILIA Multi-Stick for blush. N.A. : I put my hair in a bun in a silk Slip scrunchie overnight. It keeps my mane looking fresh and more voluminous; I just have to brush it out in the morning. A.I. : I have blunt bangs, so basically I don’t have to deal with my hair. It’s a pain having to get them trimmed every two weeks, but I love Jessica Gillin at Serge Normant so I kind of view it as a social call to see her and a small price to pay for having a low-maintenance style. I use Rahua Shampoo and Classic Conditioner every other day. J.F. : It’s a struggle. I lost a lot of hair after I had my son, and I’ve had a hard time recovering from it. I tend to wake up with frizzy hair. My girlfriend recently gave me some Slip scrunchies and I bought a Slip pillowcase, which has been a huge help! N.A. : I look at the Weather Channel app first thing to know how the kids should dress. Then I will peruse the New York Times if I have an extra moment to myself between the three kids wanting all my attention first thing. A.I. : I usually just look at my texts first thing in the morning to make sure nothing burned down while I was sleeping! N.A. : I skim all the emails that came in overnight and answer the most pressing ones from my phone. A.I. : School dropoff is usually at 9 a.m., so I’ll scroll through my emails by then, but I try not to get too absorbed until I’ve said goodbye to the girls. I can walk to the office, so I’m usually there before 10 a.m. I can properly dive in then. J.F. : I address any urgent emails or time-sensitive east coast calls because I’m three hours behind my New York–based partners. And I almost always touch base with our key manufacturers every morning to make sure we’re on track for the day. N.A. : Typically 10 a.m., but every day is a little different. A.I. : Usually before 10 a.m. J.F. : My office is fairly mobile because our headquarters are in New York. I try to spend afternoons in our Culver City location at Platform, and mornings I’m in meetings or working from home. I usually get into full swing after school dropoff and working out around 10 a.m.